Would your kids enjoy picture book inspired STEM activities? If your family loves books, STEM activities can offer fantastic learning fun! 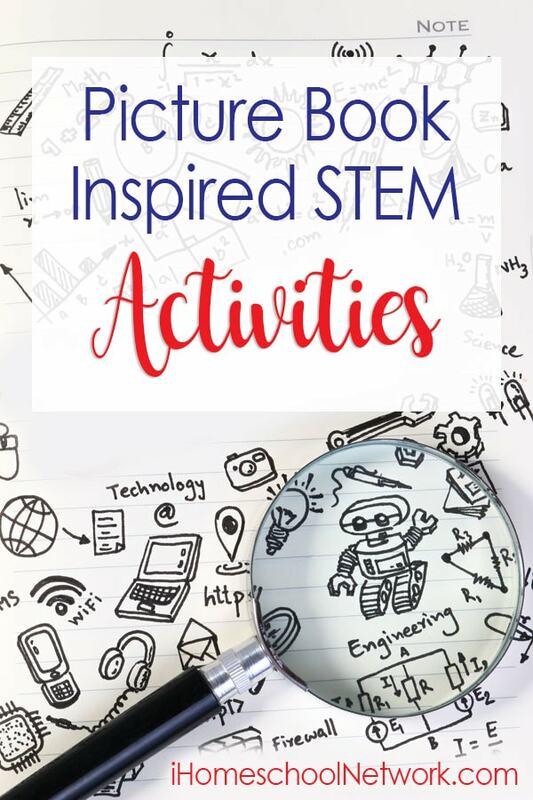 In other words, picture book inspired STEM activities create important connections with the books your family reads. We often think of reading picture books to younger children. However, many picture books are written with complex story elements that can appeal to older children as well. That is to say, good picture books naturally invite us to continue thinking about the story after we have finished reading it. So, why not make it a fun learning activity? Additionally, using picture books when teaching multi-age children is a wonderful way to help children to look deeper into the story and make meaningful connections. Why picture books for STEM activities? As a busy homeschooling family, you also will appreciate what a time saver picture book inspired STEM activities are. Since picture books are shorter stories, they can be read in a few minutes. Shorter stories leave more time for a book-related STEM activity and discussion. STEM activities invite kids to use science, technology, engineering, and math skills in a specific activity. Each of these skill areas require kids to think and apply skills to solve problems in creative ways. Picture book inspired STEM activities make using those skills both meaningful and fun. In other words, our kids can practice using ALL of the subjects areas in a single activity. Hooray!!! What does a picture book STEM activity look like? Picture book STEM activities are a natural extension of the story. STEM activities get kids thinking more about the book. They invite kids to think about why the author choose certain characters or events for the story, or what might happen next if the story continued. These STEM activities can be simple even with classic picture books. For example, let’s take the story of The Three Little Pigs. To get started, you would first read The Three Little Pigs to your kids, or your kids can read it independently if they are able. Next, ask your kids to design a warning system to let the three little pigs know if another wolf tries to sneak down the chimney. You can offer specific materials for them to use (hello, straws and masking tape!) or let them find things on their own (my favorite free and no-prep option!). Then, you let them dive right in! HINT: Have your camera nearby to catch those fun “ah-HA!” moments, too. Can you imagine the fun your kids would have creating this warning system for the three little pigs? While they’ll be busy planning, testing, and adjusting their designs, your kids would also be using several STEM skills to complete the task, too! Science, technology, engineering, and math skills are naturally part of the activity. If you are like most homeschool families, your family library is constantly growing. Visits to the public library are likely a common event, too. But how do you know which picture books inspire STEM activities? Choose a picture book that really interests your kids. We want our kids to be eager to read the book. BONUS TIP: If your kids asks to read the book a second time, the book is likely a great choice for a STEM activity. Look for books that have strong characters or characters that your kids like. Seek out books from an interesting time period or specific setting. Find books with an inspirational solution to a problem. Our Picture Book is Chosen, What’s Next? Once you have a book that meets just one of these ideas, you are ready for great picture book inspired STEM activities. After that, you are ready to decide on the actual STEM activity, focus on something simple and specific. In fact, those type of STEM activities are often easiest for kids to get excited to do! Simply put, your STEM activity is just inviting your kids to design or create something that would be helpful to the characters or relate the story in a meaningful way. It really is that easy! Cool, right? In conclusion, picture books inspire STEM activities, and your kids will have a blast connecting with the books you read together. What picture books do you think would inspire STEM activities? Looking for the picture books mentioned in this post?